Completed in 2002, this brand new property offers luxurious condominiums and plentiful amenities, all at affordable prices. The popular Factory Outlet stores are located within walking distance and all of Park City's favorite attractions are only minutes away. By taking our complimentary shuttle, or a quick drive, you will enjoy the finest accommodations and save significantly. Each of Crestview's suites comfortably sleep four to eight people and feature a fully equipped kitchen, dining area, living area, fireplace, balcony, and washer/dryer. 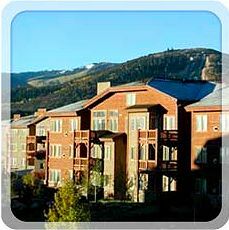 The condominiums are beautifully decorated with slate and tile flooring, marble countertops, and fine mountain furnishings. Four hot tubs provide steamy comfort after a day on the slopes, and the swimming pool, private underground parking, clubhouse, fitness area, and free shuttle service (seasonal) add to the abundance of comforts. All this, makes Crestview Condominiums an excellent property for those seeking quality, affordable accommodations. This and other Park City Bed and Breakfast Inns can be found here online in The Register.